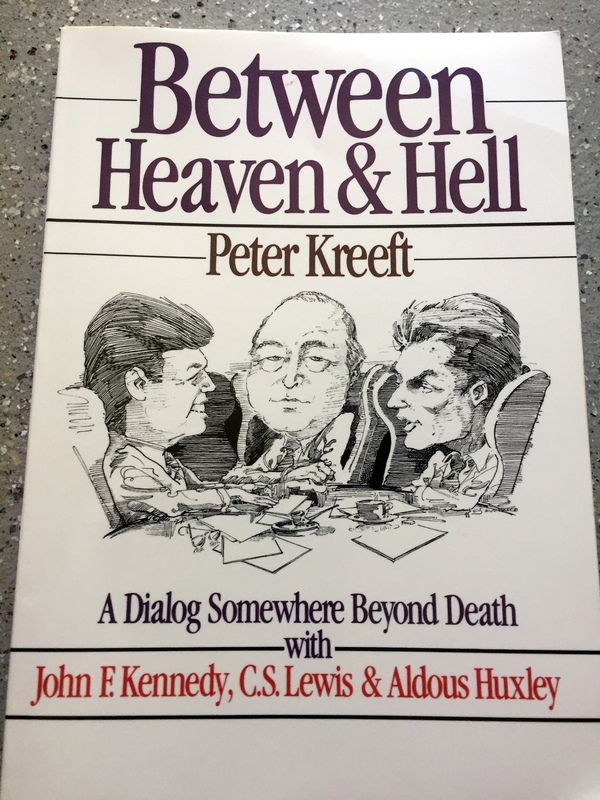 Book review: Between Heaven & Hell by Peter Kreeft (A Dialog Somewhere Beyond Death with John F. Kennedy, C.S. Lewis & Aldous Huxley), InterVarsity Press, 1982. Available here. I recently stumbled upon this book at a local consignment shop that sells a little bit of everything, including books. Peter Kreeft caught my eye as I appreciated a book where he interacted with Pascal’s Pensees. (My blog’s title is taken from a statement by Blaise Pascal.) Kreeft is a Roman Catholic professor, theologian, philosopher, and apologist. I was immediately intrigued by the book and moved it up in my “to read” pile. In it, Peter Kreeft imagines that John F. Kennedy, C.S. Lewis, and Aldous Huxley – while dead but not having made it to their eternal destiny yet – have a discussion about spiritual matters. They all died on November 22, 1963. Lewis represents a Christian theist position, Kennedy a modern humanist, and Huxley an Eastern Pantheist. Of course, C.S. Lewis and the Christian position take the lead in it. However, Kennedy and Huxley are presented as thoughtful individuals with good questions and concerns. I disliked reading plays in school, where you must understand a story by reading each person’s lines. So I wondered if this book would work for me. It is literally like you are reading a transcript of their discussion. But it did work, really well!! Bravo! The book flowed, and you could easily read this 114 page book in one or two sittings. It is a unique format for an apologetic work, and I found it a very helpful way to remind yourself of key apologetic arguments for Christian faith. In the first part of the book, most of the discussion is between Lewis and Kennedy as they focus on a Western way of looking at life and spiritual matters, but then it shifts to Huxley joining the discussion and Eastern concerns are brought into it. This reminded me of something similar in my Christology curriculum which you can access for free. One section (pages 3-4) is about the Incarnation, and I interact with J.I. Packer. People can doubt the miracles Jesus performed or the resurrection. But if we can accept the Incarnation, everything else makes sense. As Lewis words it in this book, it is the skeleton key. Since Jesus was/is God, it only follows that he would be a miracle worker, conquer death through resurrection, etc. In discussion with Huxley, good points are made about approaching a text with preconceived ideas. For example, because the Gospels have miracles, they are automatically relegated to myth. Lewis points out some circular reasoning on Huxley’s part, and that if it wasn’t for the miracles, biblical history would be accepted as certainly as secular history. Many undoubted and universally accepted events in secular history have far less textual evidence than the evidence in the Gospels. Lewis being a literary expert, explains that the Gospels just don’t read like myth either. There was challenging discussion about truth, and how we can try to avoid facing the truth. Many would prefer to believe things for a hundred other reasons besides truth. People can look away or even change the truth when it makes them feel threatened. We’d rather believe a lie if it makes us comfortable. This book was a great review of apologetic arguments for Christian faith, and I highly recommend it to you. Get a copy! ⇒ If you appreciated this book review, consider sharing it. Click below. Thanks! To subscribe to my blog, see the right column at the top.